Prominent & Leading Exporter from Ahmedabad, we offer sparfloxacin tablets and ceftriaxone 1 gm injection. 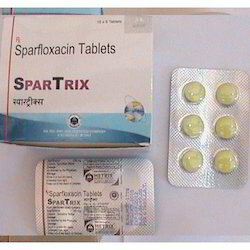 We brought forth our range of Spar Trix / Sparfloxacin Tablets which we manufacture, supply and export in wide range. Our Sparfloxacin Tablets are used for effective treatment of certain bacterial infections such as sinusitis, pneumonia, bronchitis, etc. These sparfloxacin tablets are very efficient to use made from excellent array of raw materials sourced from trusted vendors in the industry. Our sparfloxacin tablets are moisture sealed and excellently packed which are easily available to our clients at very economical range of prices.Composition: Sparfloxacin 200 mg.
Ceftrix 1 GM Injectable are also included in the range of our top grade materials which we are manufacturing, supplying as well as exporting over several different countries across the world. These Ceftrix-1 gm Injectables have been manufactured at our company using appropriate chemicals, minerals and vitamins in it which help it be more reliable and efficient. 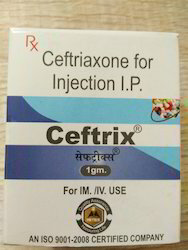 These Ceftrix-1 gm Injectables are widely being used and prescribed in several hospitals and restaurants throughout the country as well as abroad. Composition: Ceftrix 1 GM Injectable.